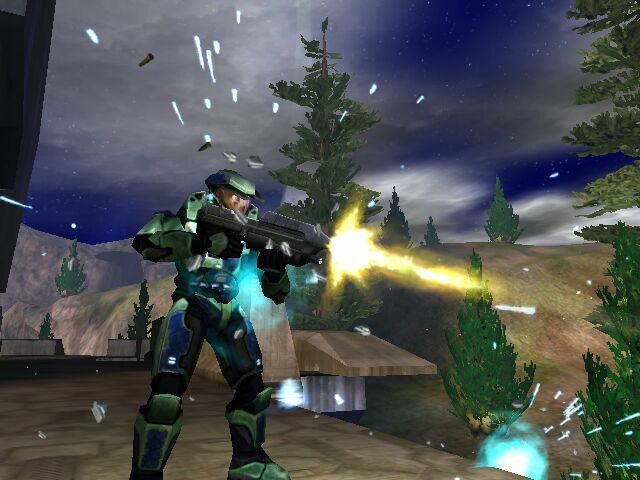 Halo is not only the first FPS game for the Xbox, but it has definitely set a high standard for all other FPS games on any console to meet. As the story begins, your ship is in the depths of space investigating an obscure alien artifact. Suddenly, your ship is attacked by a group of aliens called the Covenant. Your ship?s captain decides that in order to fight off the invading Covenant, it was necessary to bring you out of suspended animation. You take on the role of the Master Chief, a highly trained and enhanced soldier, to fight off the Covenant as they overrun your ship, and then as you crash land on the alien artifact, Halo. Fight off the Covenant and much greater horrors by utilizing a number of powerful weapons, and by fighting alongside your human comrades, and by operating a number of vehicles. As you begin the game on the easy mode, the game gives you a quick walkthrough of your controls as one of the crewmembers gives you a checkup to make sure your systems are functioning properly. The game controls very well. It almost feels more like the Xbox controller was designed specifically for this game rather than this game for the Xbox controller. If you don?t like the basic controller setup though, the controls are customizable. One of the first things you will notice is that the graphics in the game are incredible. You start out on your ship, but you quickly find yourself exploring the vast environments upon Halo. Rolling green hills, snow covered fields, and wet swamplands are just a few of the environments you will have to navigate through before finding yourself at the games end which explodes with action. The sound is also amazing. Halo may be only one of many Xbox games to take advantage of Dolby Digital surround sound, but it is one of the games that does it the best. Even without surround sound though, the games sounds are simply incredible. You may find yourself carefully listening to hear if there is an enemy just around the corner, especially in multiplayer. Multiplayer is where the game really shines. You have the option of playing a 2-player split-screen coop game, which allows you to play through the story of Halo with a friend. Another option is split screen deathwatch. This mode allows up to 4-players to play split screen on one Xbox in various types of game play. The third option is link play. With the right types of cables, you can connect up to 4 Xbox systems and play with up to 4-players on each system. This allows for an incredible FPS multiplayer gaming experience, which until recently was only possible on a PC. Not long after the release of the Xbox, GameSpy.com released software allowing you to take your Xbox online to play Halo against players from around the world several months before the Xbox Live multiplayer service went live. (visit http://www.gamespy.com for more information) The basic multiplayer game types include deathwatch, capture the flag, king of the hill, oddball, and race. From there you can customize a number of things such as health, shields, weapons, vehicles, etc. giving you a seemingly endless number of multiplayer game types. One of the biggest disappointments for me is that the coop game can only be played on one Xbox. A coop link play option would have been nice. Another problem is that the first half of the game you find yourself fighting in, while the second half of the game you fight your way back out. Basically you?ll be playing the same levels over in the later half of the game. A plot twist and exploring new areas helps to keep the game interesting enough to drive you to finish the game though. A couple of minor disappointments are that there are not more multiplayer levels, and that you cannot operate the Banshee, the flying vehicle, in a multiplayer game. Still, the game is incredibly fun and highly addictive. From a Christian Perspective, this game has a Mature rating. The game contains some minor bad language, there is quite a bit of blood from both the aliens and your fellow marines in the game (although the alien blood is not red), and the basic point of the game is to kill. ***SPOILER*** Also to add, the Flood, an alien race which you have to fight later in the game, do look like something straight out of a horror flick and that may bother some people. ***SPOILER END*** With plenty of levels, multiple difficulty settings, a gripping story, and addictive multiplayer action, it will take a while before gamers tire of Halo. When that time comes, Halo 2 should be available to continue the adventures of the Master Chief.